Earlier in my career, a job search seemed like a game with few rules and lots of competition. The best candidate didn’t seem to be selected any more often than an average candidate. My personal strategy for playing this game, where luck seemed as important as skill and knowledge, was to create a formula — something I called the “rule of five.” Every five job applications for an education administration position would result in at least one interview. After 25 applications and five interviews, at least one job offer would materialize. Over the ensuing years, the rule of 5 became the rule of 6, and then my trusted formula morphed into the rule of 10. Art Stellar introduces himself to students in his latest post as superintendent of the Burke County Public Schools in Morganton, N.C.
Has the superintendent search game changed? Most definitely. Of course, I too have changed. Early on, I often was asked in interviews, “How will you supervise people much older than you?” In the last decade, a common question has emerged, “How much longer do you intend to work?” At the age of 63, my knowledge, skills and energy levels are higher than ever, and I have a notable track record of accomplishments, but that’s not always the focus. Serving as superintendent, going into my 24th year, I have completed hundreds of applications and interviewed for nearly a hundred superintendencies. I have accepted seven superintendencies and, in more than 20 instances, have declined offers or withdrawn from consideration after being interviewed. This cumulative experience has produced a personal perspective of how markedly the process has changed over time — not necessarily for the better. The most significant change in the way school boards search for a new superintendent over the years has been the shift from focusing on the positive to dwelling on the negative. In the past, the strengths and talents of individual candidates were at the center of the search process, and the search process emphasized what a candidate did well. School boards wanted to know what you have done in previous leadership posts and what you could do to support their schools’ students. The emphasis now has migrated into finding reasons to weed people out rather than why to consider them. Background checks, drug testing and standard professional referrals have been replaced by exhaustive hunts for whatever details may be negative about a person and his/her experiences. Digging for the “dirt” seems more central in today’s superintendent searches than the capacity to raise student test scores, to close achievement gaps or to reduce the number of dropouts. Public presentations of superintendent candidates are designed to bring out personal flaws and failings. Anything deemed less than sterling is dug up through electronic channels and reported eagerly in two communities — the one seeking to fill the superintendent vacancy and the school district where the candidate currently works. As a result, the number of qualified candidates in most superintendent searches has dwindled over the years, and I believe that’s due primarily to the wholesale negativity surrounding so many searches. One interesting trend has been the proliferation of superintendent search firms. There are dozens of firms today, which has added complexity to the marketplace because school boards have many more options from which to choose. I served as a search consultant for PROACT for about 10 years, and my own experience dealing with superintendent search consultants has run the gamut from the highly professional to some real snakes. Most search consultants are simply trying to meet the needs of their clients — school boards with an important vacancy to fill. How do search consultants please school boards? The goal is to have board members feel their district can attract a candidate pool with quantity and quality. A large number of candidates is important — the more the better, in the view of the client board. Besides sheer numbers, the candidate pool also has to carry the perception of quality. Consultants actively engage in recruiting candidates to make the pool look better — experienced superintendents, prestigious university degrees, state superintendent of the year winners and so forth. A good mix of candidates helps to stretch the board’s perspective. Some consultants pigeon hole candidates based on unique attributes or recognition. One consultant used to contact me regularly, but only for extremely difficult urban superintendencies owing to my successful experiences in Oklahoma City and Boston. Another consultant only wanted me to meet school boards interested in raising student achievement based upon my track record in this area. These stereotypes are hard to overcome when a consultant is at the wheel of the search vehicle. Personally, I detest filling out forms of any kind. Most applications provide insufficient space to list all employment experiences. Fortunately, more school districts now use online applications, which can accommodate more experiences and can be saved in electronic form and more easily modified than paper forms. The killer section of the application inquires about losing certification, being under investigation, being fired, having a contract non-renewed or being asked to resign. The reality is that an indication of a problem with a school board is the kiss of death to one’s candidacy — the only thing worse might be leaving such parts of the application blank or lying that no such problems ever existed. Having experienced non-renewal of my superintendent contract, I have been tempted to skirt the truth. After all, how many experienced candidates would there be to consider if search consultants excluded everyone whom school boards have let loose? However, I’ve always considered it better to be upfront about such matters rather than try to explain them later. A simple straightforward explanation may suffice. For example, “I non-renewed an ineffective principal with strong ties to some board members.” The truth will emerge, and it is better to receive the sensitive details directly from the candidate than from someone else. 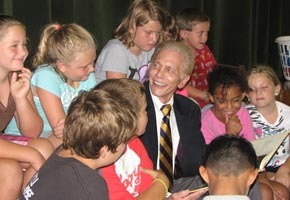 Art Stellar has served as superintendent in seven communities since the early 1980s, interspersed with other executive leadership posts in the public and private sectors. At one time, candidates generally had to respond to essay questions as part of the application process. The main intention seemed to be to weed out less-serious candidates; however, today, candidate pools are smaller and national search firms rarely require essay responses. The trend is fewer essays as there are easier ways to evaluate a candidate’s written communication skills. The rise of the Internet and search engines has made everyone a private investigator, capable of pulling together bits and pieces of controversial actions involving public officials. Search consultants and newspaper reporters used to be the only parties with the resources to dig up anything questionable. Now, once the list of potential superintendent candidates is given to school board members and the public, the googling exercise commences. Experienced superintendents are at a disadvantage because there is bound to be one or more controversial decisions (school consolidations, changes in school boundaries, budget cuts, union negotiations, etc.) in a school district where they served. As a candidate for a position you should be ready to explain anything and everything that has ever happened in public over the course of your career. Once, during a community interview in Colorado, I was accosted by a woman who had a student in the Oklahoma City Public Schools when I was superintendent there. I had no idea who she was nor what the issue might have been. While the members of the school board said this incident made no difference to them, I couldn’t help but notice how much time they gave to one bizarre complaint. I subsequently withdrew my name from consideration. The more recent advent of blogs makes candidates appear even more controversial and out of line in their actions as organizational leaders. Anyone with a personal computer and modem today can write anything on a blog and do so anonymously. While limited legal defenses are available to combat malicious cyber stories, every candidate for a superintend-ency ought to engage in an extensive Internet search of his or her background. Then, armed with material that could possibly derail a job search, you should forewarn the search consultant and/or the board members and offer your side of the story, starting with the cover letter of your application. One would hope that school board members would be on their best behavior when interviewing candidates. Some are; others aren’t. Some boards just ask prepared questions without giving any feedback. On the other hand, some boards would appear more professional if all members stuck to a script. Common courtesies are less in vogue today than 20 years ago when board members were more civil and accommodating. In a candidates’ market where vacancies often outstrip the number of experienced job seekers, you would expect boards to be their school district’s chief promoters. Yet I’ve had board members behave in the most obnoxious manner during candidate interviews. “Yes, test scores have gone up where you have been, but how can you demonstrate this was a result of your leadership?”) Under crass treatment from one board member, I simply stood up and walked out. I eventually finished the interview but withdrew from consideration. Who would want to deal with that kind of boorish behavior on a regular basis? Some school board members display their true colors even before the start of the interview. I have had board members call me days ahead of time, indicating they intended to support me. Once, a school board member in a Florida district sent his own questionnaire to candidates. In these situations, when individual board members were freelancing, I have never received a job offer, which may have saved me from working with a divided board. One of the more baffling pieces of feedback a candidate can receive is “You’re overqualified.” This may be easier to appreciate when conveyed by a search consultant on the assumption, right or wrong, this is for your own good and something better awaits you. Over the years, I’ve had half a dozen boards tell me this at the end of an interview. My initial thought when this happened the first time was “Did you look at my resume before you invited me here?” Later, I figured out boards do not always know what they want or what candidates’ backgrounds mean until they meet them in person. I have consoled myself by thinking that in such circumstances I have helped a board make a better decision. During the summer of 2009, a school board in upstate New York spent about 30 minutes telling me how great I was in terms of being overqualified. Upon reflection, the board members may have been concerned about how long I might stay. On the other hand, they might have wanted to let me down easy with a left-handed rejection. For once, being overqualified felt good. During first interviews, board members may laugh at your jokes while smiling and nodding at your every utterance or they may remain pokerfaced and motionless. Neither alternative seems to mean much, especially in the initial stages. Some boards can be genuine and friendly but aren’t the right fit. Even with a positive interaction, I have declined employment offers. I turned down a really fine group of board members in Mississippi after realizing there were no financial resources to make progress in fewer than 10 years, which would have been longer than my patience. Another board in Ohio with a vacancy to fill had the nicest group of board members I have ever met. While we would have enjoyed a terrific personal relationship, this board was mostly 20-year veterans who did not want to change anything. I would not have been able to sit still, so I declined their offer. The right superintendent would be lucky to work with either of these boards. One question most candidates want to know is whether the search is really open to outsiders or if someone within the organization already has the job lined up. Typically, inside candidates have an edge because they are a known quantity and can be employed for less money than an outside contender who also may request relocation costs. These “hometown discounts” seem to be on the rise. Many internal candidates are willing to maintain their old jobs, as well as being superintendent. There must have been a dozen situations last year in Massachusetts when an assistant superintendent in the school district added the superintendency to his or her previous duties. Inside candidates also have a local network that can influence the board members during the hiring process. Several years ago, an executive search consultant called me about a large urban district. I was told the internal candidate had “no chance.” This local administrator tapped her contacts to generate supportive crowds at public interview events. She subsequently was appointed superintendent, serving two uneventful years. In a more recent New England search, board members were quoted in the newspaper endorsing an internal candidate prior to the closing date for applicants. Another insider had her supporters lobby board members, while she claimed her “right to be interviewed.” The insiders canceled one another out. An outsider providing false praise about the school district’s test scores was named superintendent. Whether this political outcome yielded the best leadership result remains an open question. At one time, nearly all superintendents came up through the ranks, working sequentially as a teacher, principal, assistant superintendent and finally superintendent. Occasionally, someone skipped a step, but that was rare. Over time, more and more administrators have reached the top step without touching all the traditional bases, and more superintendent candidates have emerged from outside education. In some instances, a big-city school board has launched its search with the stated aim of finding a superintendent with another professional background — business, the military, law or nonprofits. While more and more nontraditional superintendents have been appointed in the past 15 years, most nonurban school boards found themselves, in the end, more comfortable sticking with executive leaders who could walk the education talk from Day 1. While serving as acting superintendent for the Boston Public Schools, I was contacted to see if I would submit a resume and cover letter for the New York City chancellor’s position. Within a week, my name surfaced in The New York Times as one of the early candidates along with the warden of a prison, a funeral home director and a few others from outside the mainstream. I hold nothing against any of those individuals or any nontraditional candidate, but I always have viewed my background in education as an asset to being a superintendent. Nevertheless, as more nontraditional superintendents are selected, more will be successful in the role. A thank you letter by a candidate is a good follow-up step after returning home from an interview. Starting out, I made notes of what every board member seemed interested in and sent individual letters and related reports to each member. This approach may have helped me secure one position, but it took me awhile to figure out I should drop the overkill. A well-composed letter of thanks is sufficient. Personally, I have had trouble throughout my career in adjusting my job hunting methodology even when it is not working. My biggest problem is my propensity to share too much written material. In fact, I have a notebook with sections for basic resume, professional accomplishments, professional organizations, civic and community organizations, consulting, publications, honors and awards, etc. My rationale has been that with a comprehensive tangible view of my history, board members and I could spend more time in conversation. Of course, my inner motive was based on the premise that no board could resist such an accomplished educational leader. Over my career, many boards have rejected my candidacy, some probably due simply to the volume of my application materials. Like a gambler, I hit the jackpot just enough with my pile of stuff to reinforce my bad habit. When sending just a cover letter and resume did not generate an interview, my inclination was to return to an approach that produced even lower results. Less resume-type materials can be more. When I was starting out as an administrator, most of the professional advice on job searches recommended conducting extensive research into the prospective school district or community. As an eager beaver, I would create long checklists of material to collect — board of education meeting minutes, union contracts, newspaper articles, test scores, demographics, state reports, board policies and so forth. I would call colleagues who might know something and would travel to the community a day in advance to drive around and meet people. With all these insights in hand, I could be pretty impressive in an interview, but typically I just impressed myself. My judgment gradually evolved to the point where I think just a few things qualify as essential bits of information heading into a job interview. What did people in the school district and community like or dislike about the last couple of superintendents? What are the top four issues in the district and community? Who are the main players in the educational community? Only once did exhaustive research help me — and it wasn’t to land the job. In one superintendent search, the choice was down to me and one other candidate. I had researched all available information, which pointed to the teachers’ union having nearly total control of every major decision in that district. Because I wasn’t interested in becoming a figurehead, I withdrew, which for me was the correct decision. I’ve discovered most school districts are more alike than they are different. The key in preparing for an interview is to identify the differences. Often the most important consideration isn’t winning the job but deciding whether you are a good fit with the board, the school district’s characteristics and particular needs. School board members and community residents used to speak with pride when their school superintendent was recruited to explore other top leadership positions. The feeling was “We have an outstanding superintendent who is very attractive to other communities.” Today, communities seem much less tolerant of their superintendents exploring other career options. Ideally, superintendents should share career explorations with the head of the board. Few superintendents can withstand the public outcry of betrayal if it becomes widely known they are candidates for more than one new superintendency within the period of a year or so. It’s often not long before those superintendents hear the taunting calls for them to pack up and leave since they seem to want to work somewhere else. Open searches exacerbate these situations. Only one person is going to be offered the position, leaving everyone else exposed. On a professional level, I advocate for confidential searches. Some superintendent searches are advertised as confidential, yet if the search involves anyone outside the school board and an executive search consultant, confidentiality may be compromised. As a finalist in a prestigious school district in a Middle Atlantic state, I was told the candidates in the search would be guaranteed confidentiality. One board member asked a friend of his to “check out Stellar.” His friend found a front-page article in my community’s newspaper stating that I had legally changed the spelling of my last name from “er” to “ar.” He proceeded to call the reporter asking what was left out of the story. In the course of conversation, the reporter figured out I was a finalist for another superintendency. Due to the lack of confidentiality, I withdrew, but not before my hometown paper reported I was a candidate. The newspaper in the community where I was applying also ran a story about a finalist changing the spelling of his last name, as if changing a vowel was a means of disguising my identity. I’ll bet John Wayne didn’t encounter suspicion when he changed his entire name. To hide my identity during an open search, search consultants have given me fake names to use at hotel registration. Still, I’ve had television news cameras follow me to the airport when I was flying to an interview. The problem with the public search is that not being selected leaves a mark (whether or not you withdraw). Both your current school board and the wider community can feel betrayed if they learn of your candidacy for another superintendent position. Future boards also may be reluctant to hire someone who failed to land a superintendent’s post in another community. Among the 13,900 school districts (the most recent figure reported by the National Center for Education Statistics), many opportunities are available for working with dedicated governing boards in school communities where teaching, learning and children are the principal focus. While I never have discovered my utopia, school boards have likewise never found me to be absolutely perfect as a candidate or as their superintendent. Yet along the journey, I have encountered many people who care deeply about children learning and the future. The superintendent search and selection methods seem less of a game now than they once did. However, in my weathered view as a candidate in these searches over the last three decades, a more systematic process that consistently serves all parties still seems to be an elusive goal.